For a run-through of weekly markets, visit here. Ok, this one’s not free, but it’s affordable and – let’s face it – who can say no to winter sports in Florence? Ice skating, tubing, and modified skiing are all hosted at this winter park that stays open til spring. Sliding down the snow on the banks of the Arno? A winter fantasy made real, if we do say so! When the best of Bavaria sets up camp in Piazza Santa Croce for most of the month. Mulled cider, giant pretzels, and German ornaments surprisingly fit perfectly here. Wandering through these stalls is like taking a free, festive mini-trip to the Alps! Open 10 a.m. to 10 p.m. each day. A larger program that showcases contemporary art, design and culture on Via Maggio (in the Oltrarno) from December 4-24. For the full lineup of events, visit here. As announced in July, all state museums are now open to the public for free on the first Sunday of every month. A very special two-day fierucola taking place in Piazza SS. Annunziata instead of the usual Piazza Santo Spirito. Open from 9 a.m. to 8 p.m. each day. The magical evening when Florence’s glittering holiday decorations fully light up for the season. But during the day, plan for closings! The “New Florence Project” is a collaborative art project featuring the works of 16 artists, both Florentine and American, who have created artwork mixing inspiration and imagery from both Florence and New York City. The show is free, as is the opening event, which will feature food, wine and holiday shopping at the Sala delle Leopoldine in Piazza Tasso. There are also a number of other free events coinciding with the show, all hosted by the Claudio Ciai Foundation. For all the details, visit here. On the second Sunday of every month (excepting July and August), Florence’s civic museums are free for residents! You will need an identity card or a Bacione al Firenze card to gain free entry; visit here for all participating museums and card details. How better to celebrate the season than by caroling in the Oltrarno? Head to St. Mark’s English Church at 6 p.m. for some holiday singing, then stick around after for mince pies and Gluhwein. On the 14th singers will head around the neighborhood, and on the 21st they’ll stay indoors for Nine Lessons and Carols, so plan as you like. Gregorian Chants by Ensemble San Felice. The event starts at 9 p.m.; entrance is free until full. A special holiday fierucola in Piazza Santo Spirito. Open from 9 a.m. to 7 p.m. each day. Seriously, get your behind to a church, just for the experience! Plus, everything else is closed. Basically an extension of the Christmas celebration. Plan for closings! Festivities across Florence! Expect open-air concerts in some of the major piazzas and even a fireworks show over the city at midnight. Have fun and stay safe! Close to 700 people will participate in a parade from Palazzo Pitti to Santa Maria del Fiore, and many will be dressed as if they just stepped out of Benozzo Gozzoli‘s famous fresco The Procession of the Magi. At the end of the procession will be the Three Kings, bearing gifts for the living Nativity waiting outside the Duomo. Their arrival will kick off a whole host of festivities, including a balloon launch! For a detailed timeline, visit here. Free guided tours of the Sacristy of Santa Maria del Fiore and the Old Sacristy of San Lorenzo. Reservations required; call 055 2616056. Florence celebrates its first bishop at the column that marks the site of one of his miracles. There will be a historical parade to honor him in Piazza del Duomo at 9 a.m. For more of San Zanobi’s story, click here. Entry to this artisanal chocolate fair in Piazza Santa Maria Novella is free! Trying to escape without buying a few sweets proves a bit more difficult. Pop record producer Michele Centonze at 3 p.m. Since San Valentino was a Roman saint, there’s no place more appropriate to celebrate Valentine’s Day than in Italy. Click herefor our dreams of how to spend the day – for free, of course. In the spirit of love, however, we recommend stopping by Piazza Santa Maria Novella at 7 p.m. to participate in 1 Billion Rising, when 1 billion people worldwide are expected to stand up and dance in opposition to violence against women. So shake what your momma gave ya for all the mommas and future may-be mommas out there! As the last Medici with no heir, Anna Maria Luisa knew that she would have to protect her family’s legacy following her own death. Therefore, in 1737, she established the Family Pact, which turned over all Medici property – including the family’s immense art collection – to the state, under the condition that it never be removed from Florence. As a thank you for her kindness and foresight, Florence opens its museums every February 18th with free entry and free guided tours for locals and visitors alike. Here are the details for this year’s event; please note that Santa Maria Novella is not offering free entry this year. Incontro con l’autore: Brahms e la Sonata per violoncello e piano op.38 n.1 in mi min (mov. I-II ) e la Rapsodia op 79 nn. 1 e 2 per piano solo at 11 a.m.
Venice it’s not, but Florence is still pulling together something great for local kiddos who want to celebrate Carnivale. Jugglers, acrobats, magicians and more will line Cascine Park, with walkways and pavilions filled with entertaining workshops, tasty food carts, and even a few clowns. Safe to say there’s something to keep both adults and tikes happy. For all the details, visit here. Visitors are encouraged to adopt a female artist and flush out her Wikipedia page, with hopes of increasing visibility for women often ignored by history. So grab your laptop and pull up a chair next to scholars, art historians, students and more – all will be working together to get this important job done. Both English and Italian entries are accepted, and admission is free. If you can’t make it to SUF, email linda@advancingwomenartists.org and she’ll give you an artist you can work on at home. Each year since 1945, Italy has celebrated International Women’s Day, drawing attention to women’s rights locally and globally. At a time when women are still advocating for equal treatment, it’s nice to take a day to celebrate their both their grand achievements and everyday contributions. As a “thank you for all you do,” expect to see men giving their mothers, daughters and friends handfuls of bright yellow flowers – mimosas. Even better, today women enjoy free entry to Florence’s civic museums, the Torre di Arnolfo, and the Brancacci Chapel! Here’s how to secure reservations. It’s hard to be a foodie on a budget. Most high-end meals are well out of our price range, but that doesn’t mean our taste buds are any less sophisticated! For those caught in a similar dilemma, may we introduce you to Fuori di Taste? It’s the city-centered series of events to complement Taste, the large food show happening at the Fortezza. Entry to Taste certainly isn’t free, and, to be honest, neither are most of the meals hosted by Fuori di Taste. But they are doing something great by hosting lectures about food and tastings around the city, some of which are fully gratuito. Comb through this calendar of events to plot our your plan of attack. Buon appetito! Time to hit up our favorite Irish pub (run by a Scot) in town – Finnegan’s! Grab a zeppola (Italian pastry typically eaten on this feast day) and something small for dad. Traditionally, the day is celebrated with bonfires and pageants. In addition to its regular hours, the museum will open from 2:30 p.m. – 5:30 p.m., with free entry for visitors to the first, second and third floors of the museum. Interested parties can even make reservations to take one of two guided visits of the third floor and terrace. Any details you might need to plan your visit are here. Here’s your cure for that twinge of cabin fever you’re feeling: each spring, the Italian Environment Fund (FAI) offers free admission to 700 heritage sites across Italy – some of which are otherwise closed to the public. Stay tuned here for a full list of openings. This screening is part of a larger, beautiful friendship between the Odeon and Palazzo Strozzi. The Odeon will host free screenings on Tuesday nights of films inspired by one of the two shows currently up at the neighboring museum. The show starts at 8:30 p.m. Visit here for the full lineup; admission is free (depending on availability). From The Florentine: Contemporary Italian artist and painter Roberto Ferri is inspired by Baroque painters and other old masters of Romanticism. His new exhibition, Roberto Ferri e l’eternità della pittura, contains around 15 paintings that depict perfectly realistic anatomical representations of the human body, natural poses and life-like expressions. Another iconic aspect of his painting, which can be observed here, is the harmony between good and evil. Why, might you ask, should you care about a bunch of citrus trees? Well first, because they’re down-right beautiful and smell good to boot. But most importantly, each of the plants in the limonaia is descended from a Medici cultivar. The collection features lemons, grapefruits, limes, oranges and more. Entry to Boboli isn’t free for everyone, but once you’re in, access to the limonaia is free – but only on Wednesdays from 10 a.m. – 1 p.m. For more details and dates, click here. From The Florentine: In addition to 200 events in 50 different locations (all free of charge), Florence is turned into a wonderful place of discovery and adventure for children for 3 days. This first year of the Children’s Festival (Festival dei Bambini) opens up museums, monuments and churches as places of discussion, theatre productions, cinema screenings and more! The free activities are linked to the history of Florence and are sure to keep your little ones entertained! From The Florentine: The Florence International Choir festival is warming up in April with a fantastic free concert from Coro Sacra. 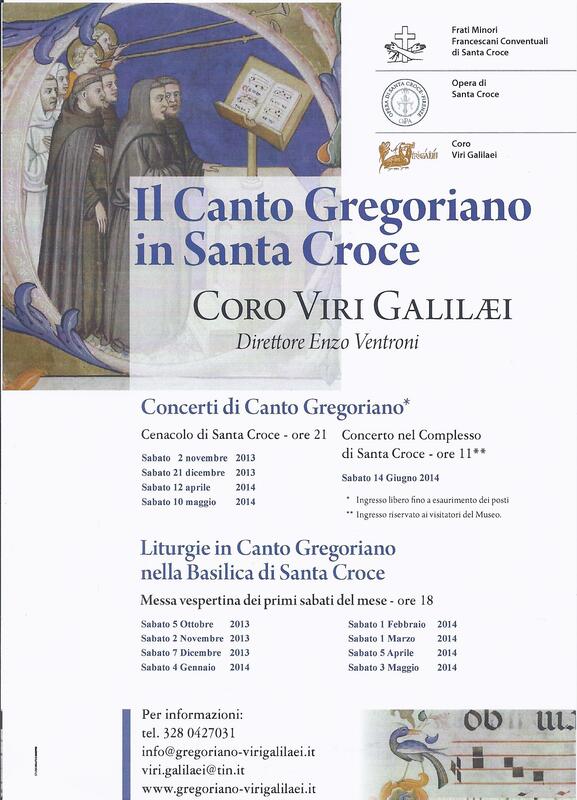 40 singers from two outstanding church choirs in the Greater Atlanta area, Georgia, USA, have travelled to Florence to perform a sacred repertoire in the beautiful surroundings of the Santa Trinita church. Directed by Emily Floyd and Michael Henry, soloist Michelle Martin and the choir will sing pieces by Mendelssohn and Mozart among others. For a full program, email info@florencechoirfestival.com. Florentines have celebrated Pasqua for almost 400 years with an electrifying event called the Scoppio del Carro, or the “explosion of the cart.” Highlights include: a procession of musicians and flag throwers led by a pair of dressed-up bulls pulling a cart rigged with explosives, a (fake) dove propelled by sparks that shoots through the Santa Maria del Fiore, and close to 10 minutes of pyrotechnics set off right in between the Duomo and the Baptistery. Make your way down to the Duomo early (around 9 a.m.) so you’ll have a front-row view for the controlled madness. The parade starts at 10 a.m. and the light show around 11 a.m.
Is everyone around the city looking extra chic this week? Make sure to dust off your best-looking duds because Design Week will have taken over Florence. “Professionals from all over the world, companies, universities, buyers, art directors, enthusiasts, artists will gather in Florence, in the heart of the city, in the most beautiful days of the year, for an all-round experience of LifeStyle, Pleasure, Art de Vivre in the name of business and conviviality.” Click here for locations and the full program. Public holiday commemorating the 1945 liberation of the country at the end of World War II. Plan for a possible parade – and closings! Opens today! Time to tack another incredible stop onto our San Miniato walk! The Iris Garden on the east side of Piazzale Michelangelo is in full bloom now, but only for a short while. The garden, dedicated to Florence’s iconic giglio, has been a sanctuary since 1954 for all types of irises donated from around the world, including Japan and the United States. Paired with the Rose Garden, which will also be in bloom, anyone who makes the walk in the weeks to come will be in for a visual and fragrant treat. Click here for more information. Notte Bianca is a marathon of excitement and overstimulation. On this magical, random night, museums, stores, and restaurants host free events until sunrise. We’re talking spontaneous mid-street concerts, late-night picnics in Palazzo Pitti, and DJ dance parties at La Specola; partiers that last until 6 a.m. can even have breakfast with Mayor Matteo Renzi in Palazzo Vecchio! So don your best white duds, double that shot of espresso, and expect to be up all night celebrating local music, art, and history throughout Florence. A bona fide public holiday in Italy. That means explorers should be prepared for closings (mostly banks and offices) but can expect historic parades, random concerts, and free entrance to some of the city’s best museums. Visit here for this year’s listing of free entries. Lots of gelato tastings and ice-cream centered events in front of the Santa Maria Novella train station. You’ll have to purchase a tasting card to get to the good stuff (around 12 euros), but considering that it’s a festival exclusively dedicated to Florence’s most famous dessert, your will power to resist it probably won’t last long. We say give in early and enjoy the full 4 days! For all the details, click here. Time to tack another incredible stop onto our San Miniato walk! The Iris Garden on the east side of Piazzale Michelangelo is in full bloom now, but only for a short while. The garden, dedicated to Florence’s iconic giglio, has been a sanctuary since 1954 for all types of irises donated from around the world, including Japan and the United States. Paired with the Rose Garden, which will also be in bloom, anyone who makes the walk in the weeks to come will be in for a visual and fragrant treat. Click here for more information. The second Thursday of each month, Palazzo Strozzi holds a free concert, art show, and aperitivo in its open-air courtyard from 7:30 – 10 p.m. Yes, you read that right: you could be rubbing elbows with the Florentine elite while nibbling on Italian finger food in the midst of Renaissance architectural greatness. As if that wasn’t good enough, let us remind you that the Strozzina is gratis every Thursday evening from 6 – 11 p.m., so guests can enjoy both spaces on the same night at no cost. Hosted by the Firenze Marathon Team, Guarda Firenze is a “a sport event for everybody to rediscover Florence by running or walking amidst the beauties of Florence historical center.” Participants can chose from 3 – 10 km routes that will take them through the likes of Piazza del Duomo, Piazza della Repubblica, over the Ponte Vecchio and out the Porta Romana. Full information can be found here. Once in awhile, Florence’s biggest museums throw open their doors, stay up late, and say, “Take me, I’m yours!” This is one of those special nights. Last year, from 7 p.m. to 1 a.m. visitors enjoy free entry to the Accademia, the Uffizi, the Galleria Palatina at Palazzo Pitti, Palazzo Vecchio (open 6 p.m. until midnight), the San Marco Museum, and a smattering of Medici villas: Poggio a Caiano, Cerreto Guidi, and Petraia. Stay tuned here for this year’s participating places, which is still being confirmed. Across Italy, wineries will open their cellars and vineyards for public tours and tastings tonight. You’ll just have to pay your way to the countryside and then spring for a glass of wine (or two). To find a participating spot, click here. Put your Italian pride pants on! Each June 2nd, the country celebrates the founding of the Italian republic in 1946 following World War II. You should expect to find some businesses and offices closed, but there is likely to be a special mass starting at 9 a.m. in the Duomo, followed by events throughout the rest of the day. We’ll post all the details once they’re announced. The exhibition in Palazzo Vecchio hosts the thirteen surviving pieces of a set of panels which Pontormo painted in c. 1514 for the monumental float used in the ancient Funzione degli Omaggi. The panels will be on display alongside all the other paintings and sculptures – never shown in public before now – that adorned the float until it was eventually dismantled some time between 1808 and 1810. There will be a free guided tour at 6 p.m. today. Reservations required; call +39 055 2469600 or email prenotazioni@palazzostrozzi.org to affirm your place. For full exhibit hours and details, click here. The Duomo’s gnomon, an astronomical instrument installed by Paolo Dal Pozzo Toscanelli in 1475, will (somewhat) capture the summer solstice on June 21st. The first 150 people to fill Santa Maria del Fiore at 12:30 p.m. will be able to witness the sun passing through a bronze plate in the cathedral’s dome, casting a bright circle that fits perfectly within the marble circle built into the Duomo’s floor. It was used to measure the position of the sun in the sky throughout the year, but only on this day will it fall directly in line with the Cathedral floor. Guests are also encouraged to visit for viewings at 12:30 p.m. on the surrounding weeks for a good look and interesting information. For a much better explanation of the history and science involved, visit here. For official event information, click here. Even Florence’s old pros will agree this is a whole new way to experience Santa Maria del Fiore: the nighttime concert doesn’t start until 9:15 p.m., which means you can expect haunting Gregorian chants and classical music under the shadows of Brunelleschi’s dome. For full details, click here. In celebration of Firenze Hometown of Fashion, Stefano Ricci has donated new lighting for the Ponte Vecchio, to be unveiled tonight. The ceremonies will be hosted by none other than Andrea Bocelli, but perhaps the main attraction is the “aquatic spectacle on the Arno” by the French company Ilotopie, who will perform a larger than life show on the Arno itself for the city to enjoy. The show starts at 10 p.m.
Wind your way through the sea of purple to catch Calcio Storico matches and parades. The day ends with fireworks that rival that of the 4th of July, set off from Piazzale Michelangelo. One of the most fun (and free!) days on the Florentine calendar. Click here for more info. From special fairs and markets to live music and theater, there’s literally something for everyone during the city’s tribute to summer. Most events are held in open-air centers and many are free to the public; check the site’s calendar for the daily rundown of all the exciting things happening. Reasons why we’re excited about Archeological Nights in Florence: 1. just when you think you might be tiring of the Renaissance (not that it would ever happen! ), museums switch things up stay open late night with special tours and displays to take you even further back in time (Etruscans, we’re looking at you); and 2. we’ve never seen a program with so many different museums, locations, and events that have “Ingresso: gratuito” listed after them. So channel your inner Indiana Jones, hop a bus to the surrounding Florentine hills after the sun sets (and the temperature drops), and dig deep into the history of the surrounding area! Florence’s nearby neighbor hosts its infamous horse race. While the race is short, the festivities will start early and last all day. Take a short ride to experience the madness or head to a nearby bar to have a front-row seat from the comfort of your own city. An incredible opportunity to interact not only theatrically but also with the special Pontormo and Rosso exhibit currently on display at Palazzo Strozzi. It is “a theatrical laboratory project involving actors as inmates of the prison of Volterra.” The event has been specially adapted for the Strozzi space, and the audience will become a main protagonist. Attendance is free and open to the public, and guests are asked to bring a book and suitcase. The show starts at 6:30 p.m. For all details, visit here. The open-air movie series held in Piazza Santissima Annunziata returns for its third go. The flicks are screened nightly at 9:30 p.m. Pop your own popcorn and head to the square for some interesting films and some summer fun! Program coming soon – stay tuned to here. Every Monday at 8 p.m., persons of all levels are invited to try yoga in the midst of one of Florence’s most beautiful parks. All details here. Guests are welcome to enjoy classical music within the walls of Michelangelo’s family home. Concerts begin at 9 p.m. but the program changes by night; visit here for the 15th and here for the 22nd. Entrance is free but reservations are required. Interested persons can book by calling 055.241752. From special fairs and markets to live music and theater, there’s literally something for everyone during the city’s tribute to summer. Most events are held in open-air centers and many are free to the public; check the site’s calendar for the daily rundown of all the exciting things happening. Some of the free events featured over the next few weeks include concerts, short films and aperitivo in the Horticultural Garden (on August 17th, 18th and 22nd, respectively). The public is invited to take a seat at the piano currently placed in the atrium of Palazzo Strozzi. “Any pianist, wheter professional or not, can take their place at the piano placed in Palazzo Strozzi’s magnificent courtyard, after booking their space at the Palazzo ticket office.” Playing hours are between 12:30 p.m. and 3 p.m. until August 31st. As announced in July, all state museums are now open to the public for free on the first Sunday of every month. If it’s a beautiful day and you’d rather not be inside, the newly reopened Forte Belvedere will also offer free entry and guided tours of its new exhibit on this Sunday. To mark the 70th anniversary of the German army destroying Florence’s bridges (except the Ponte Vecchio) during its retreat from the city, the Boboli Gardens are partnering with Arca Azzurra Teatro to host a gathering – complete with photos, films, readings from unpublished historical documents and more – that chronicles the days that preceded and followed Florence’s liberation. It starts at 9 p.m. in the Piazzale della Meridiana of Boboli Gardens, with free entrance from the courtyard of Piazza Pitti. Visit here more information. San Lorenzo was a beloved martyr with a legendary personality, so each year, a crowd gathers around his church to honor him with dancing, free concerts, and – the best part – free lasagna and watermelon. Remarkably, this feast day also always coincides with the Perseids meteor shower, and the show of shooting stars is famously known as “San Lorenzo’s tears.”Head to a rooftop terrace, grassy knoll, or open space and simply look up. Shops may be closed, but check the local paper to see if there’s a free festival or two in town for those brave enough to not flee seaside. Or join the crowd and jump a train to the beach – we’re sure there’s something to the masses’ exit. Last summer’s favorite photo competition is back. For the love of social media, you are free to waltz into a number of different hotels and head for their elaborate terraces. Each will offer an incredible view of Florence that normally you might have to cough up a high number of euros to see. Simply tell the doorman you’re there for the terrazza and wave your camera as you head in. Then snap your best shot from the top and post it with #tcv2014. Vistas, prizes, and bragging rights await! Ends October 4th. Every Thursday, the Florentine Jewish community is welcoming the public to the Synagogue for a cultural event and aperitivo (kosher of course!) in the Synagogue garden. Known as Balagan Cafe, visitors enjoy free entry, live concerts, and cultural events in addition to guided tours of the property from those who know it best. Food and drink is available for purchase but not required. The activities start at 7 p.m. and continue onto the night. For each Thursday’s specific lineup, visit here. A parade of lit lanterns ends in Piazza Santissima Annunziata to honor the tradition of farmers who used to make the trek from the countryside to sell their wares in the city. It ends with many children, lovingly observed by their parents, setting their lanterns on fire and shooting spitballs at passersby. That’s our kind of festival. The first foundation stone of Santa Maria del Fiore was laid today, on Mary’s birthday, in 1296. In celebration of both events, Florentine residents can visit the Bottega dell’Opera di Santa Maria del Fiore from 9:30 a.m. to 5 p.m. for free. The Grande Museo del Duomo will also keep regular hours for the public during the holiday. With the help of volunteers from the Angeli del Bello, participants will make natural and manmade discoveries–coats of arms, statues, plants and animals. Children will then invent a personalized coat of arms and motto of their own. From 10 a.m. to 1 p.m.; for children 7 and up. Reservations and the presence of one parent required. To make a reservation, email incontri.stibbert@gmail.com. During guided walks in the garden, participants will gather inspiration from natural and manmade elements. They will then transform those experiences into spontaneous texts for improvisational singers, Francesco Ronchetti and Julian Spizz. From 3:30 p.m. to 6 p.m., with the performance at 5 p.m. For families and adults; reservations recommended by emailing incontri.stibbert@gmail.com. In honor of the European Day of Heritage, many museums are only charging 1 euro for entry and even staying open late until midnight. Participating museums include Palazzo Vecchio, Museo Novecento Firenze, Museo Stefano Bardini and Fondazione Salvatore Romano. A heads up that there will be throngs of people running and walking through Florence today – but this time for a great cause. This event raises funds in the fight against breast cancer. If you’d like to get involved, just 10 euros will get you a t-shirt and access to either the competitive run around Florence or the easier, shorter walks around city center. Click here for all the info you need to get started. A celebration of the local grape harvest since 1926, Impruneta – a small town just outside Florence – spends the entire month of September celebrating its local product. A la Siena’s Palio, Impruneta’s four districts compete to build the best float to present in the parade that takes place on the last Sunday of each month, the culmination of the festival. Of course, you can’t have a grape festival without copious amounts of wine and other gourmet Tuscan accoutrement. Last summer’s favorite photo competition is back. For the love of social media, you are free to waltz into a number of different hotels and head for their elaborate terraces. Each will offer an incredible view of Florence that normally you might have to cough up a high number of euros to see. Simply tell the doorman you’re there for the terrazza and wave your camera as you head in. Then snap your best shot from the top and post it with #tcv2014. Vistas, prizes, and bragging rights await! Festival dell Generazioni attempts to bridge the age gap between younger and older generations in Italy and build towards a more economically vibrant and sustainable future. There are three days of events–including research, lectures and analysis in addition to concerts, workshops and more–will be held in major piazzas across the city. All events are free, but some require reservations. Check out the full schedule and claim your spot at the top events here. Palazzo Strozzi and the Odeon team up for greatness again to coincide with the opening of the museum’s new show, Picasso e la modernità spagnola. Each Tuesday evening in October, the public is invited to watch films (for free!) that complement the themes explored in the exhibit: war, political struggle and the tension between the traditional and modern eras. The films include Land and Freedom (October 7), Women on the Verge of a Nervous Breakdown (October 14), The Discreet Charm of the Bourgeoisie (October 21) and Open Your Eyes (October 28). For more details on the films being screen, visit here. An annual feast day to celebrate Florence’s patroness. This year, the annual historical parade will depart from Plagio di Parte Guelfa at 3:45 p.m. and arrive at the Duomo at 4:30 p.m. There, a candle and wreath will be offered to the patroness. Painters and writers–amateurs, professionals, students, etc.–are invited to join us for an afternoon of “plain air” creativity. The fun runs from 2:30 p.m. to 6 p.m., with a reading at 5 p.m. Please bring your own supplies; reservations recommended by emailing incontri.stibbert@gmail.com. Across 120 locations in the country, there will be various walks held to help participants discover and rediscover hidden gems in their own neighborhoods–an exercise we wholly support. In Florence, the theme is “from the history of plants to the history of writing.” Those who complete the itinerary will be awarded on arrival at the palazzo with a special lecture on the Lippi Madonna there and be shown a secret staircase in the library. The event kicks off at 10 a.m. and walks will leave from the Botanical Gardens until 4:30 p.m. For all the details, visit here. Fiera di Firenze: Shop & The City will feature over 350 artisans and vendors sharing their talents and wares at the Fortezza. Visitors can expect live DJs, cooking demos and art exhibits in addition to multiple markets stocked with beautiful products from Florence and the surrounding region. No matter your interests–home decor, design, books, food and wine–you’ll be able to explore it here. Entrance is free. For a sneak peek at all there is to see, click here. This biannual fair brings together over 300 institutions, private companies, schools and training organizations at the Fortezza da Basso to celebrate art restoration and its important place in preserving cultural heritage. While entrance isn’t free, there are a number of special discounts for students, teachers and most persons related to the restoration field. So we say get your scent story together and shell out the remaining few euros for what is sure to be an important show. Full details on the event here. Cultures (quite beautifully) collide at the annual Japanese Festival, which–to our joy–offers free entry! Try your hand at calligraphy and origami, enjoy the visual delights of Japanese dance and karate, then sample what is sure to be excellent food and drink–all while strolling Villa Strozzi’s lovely Limonaia. Open each day from 11 a.m. to 8 p.m.; click here for more information. A hipster’s dream come true. Comb racks of vintage threads, accessories and more at the beautiful Limonaia Stibbert. Plus, from 7 p.m. until midnight on Sunday you can enjoy aperitivo and live music to be followed by an after-party with DJSet. On Sunday night from 6 p.m. until 9 p.m., guests can partake in another aperitivo and another appearance by DJSet. Visit here for all the details. Florence’s biweekly organic market will this week focus on “new oil,” meaning it’s time to shore up your deep reserve of olive oil with delicious, newly harvested reinforcements. Crowds will snake their way past the city’s top monuments for this year’s 31st running of the Florence Marathon. Even if you didn’t think to bring your running shoes to Florence (or aren’t up for a leisurely 26.2-mile stroll), we’re convinced cheering on from the sidelines will still max out your endorphins without fully taxing your form. Seems the event’s organizers agree–this year, they’re starting the “Firenze Marathon Clap Contest,” where groups of no more than 10 are encouraged to spread out along the route and amp up cheers using any “any kind of artistic display.” More details here. Feliz! Thanks for your interest. Unfortunately there are no details (yet) on walking on the Duomo’s terraces. Right now, this is the only information posted on the celebration: http://operaduomo.firenze.it/eventi/r/3-festa-dell-opera-di-santa-maria-del-fiore. That said, Florence is known for announcing events and access very closely to the date it occurs, and past events are often great indicators for what to expect this year. As soon as we hear it’s happening, we’ll let you know!